Choice Remarks: Why did The Oklahoman publish an editorial in its news pages? Why did The Oklahoman publish an editorial in its news pages? 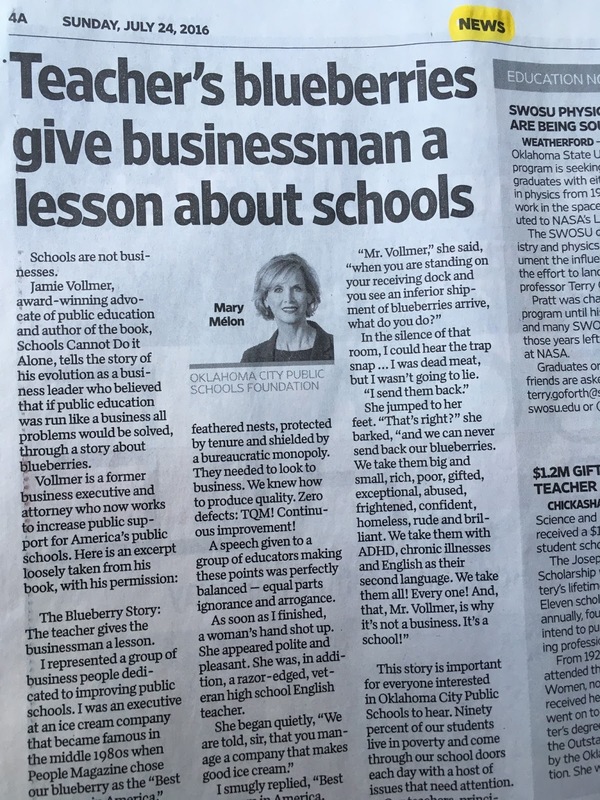 In an editorial which appeared on Sunday in The Oklahoman, Mary Mélon, the president and CEO of the Oklahoma City Public Schools Foundation, wrote about Jamie Vollmer, a former businessman who used to argue that schools should be run like a business but later changed his mind. You can click on the link above to read her editorial. I'm not a big fan of the piece; I tend to agree with Joseph Bast that the blueberry story "doesn't live up to its billing." After all, "children are not 'raw material' in a production process. They and their parents are customers with legitimate expectations of being properly served." 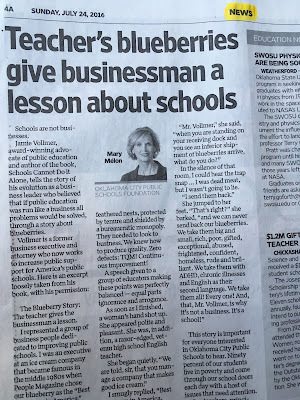 We can certainly discuss the merits of the argument (as Trent England and I did on the radio this morning), but what puzzles me—and I suspect puzzles other readers—is why an editorial column is running in the news pages of The Oklahoman. The piece seems out of place on page 4A. Are other nonprofit executives going to be writing in the news pages now, or is it just Mrs. Mélon? Here's hoping the paper will provide an explanation.